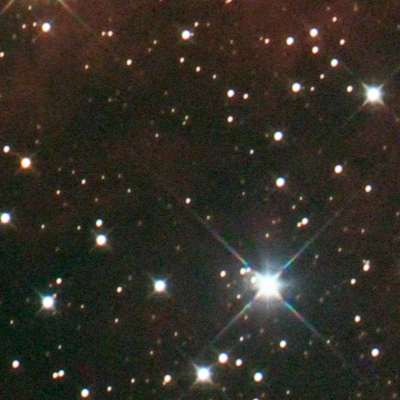 The Astro 40D image has been cropped slightly to more closely match the overall QHY9 view but image scale has not been changed in the 100% crops. 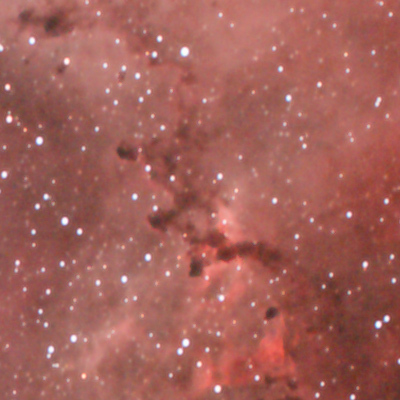 Astro 40D image on the left is 23 * 5 mins sub-exposures at ISO 1600. (I know from previous tests that this ISO setting gives the best result and that there is almost no difference between ISO800 or ISO1600 in the end result). 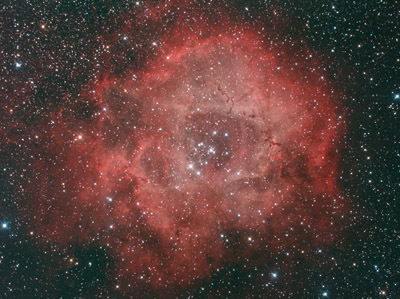 QHY9 image on the right is 11 * 5 mins Luminence and 4 * 5 mins for each RGB filter. (Shooting more Luminence and less RGB may have shifted the result a little more in favour of the QHY but not significantly). Ambient temperature was around +20 deg Celsius (~70F). Astro 40D with cooling on was running at around 0C (32F) while QHY9 was running at -20C (-4F). 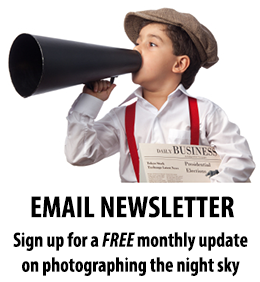 All images calibrated and combined with ImagesPlus and final processing in Photoshop. My initial reaction - the difference is much less than I expected. 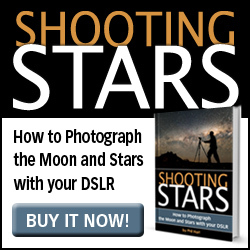 The cooled DSLR is putting in a very impressive performance against the KAF-8300 sensor in the QHY9. 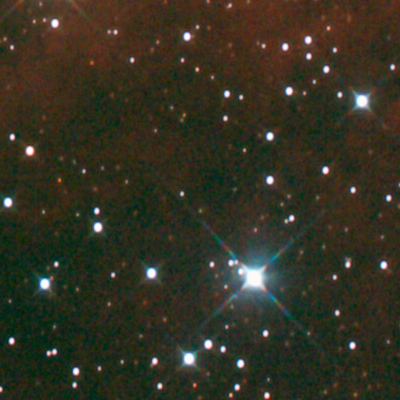 As you would expect when you look more closely, noise levels are higher in the Astro40D and the QHY9 delivers greater resolution in the nebula and picks up fainter stars. It is also likely that the difference in noise levels would be more pronounced when imaging at slower f-ratios and/or on fainter objects. 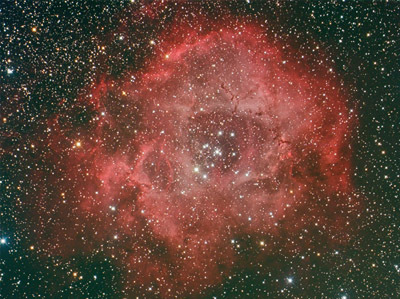 A spectrum enhanced 40D without the cooling modification would show much higher noise levels, while a standard off-the-shelf Canon 40D would not be sensitive to the red emission from this Rosette Nebula so the whole image would be very faint indeed. 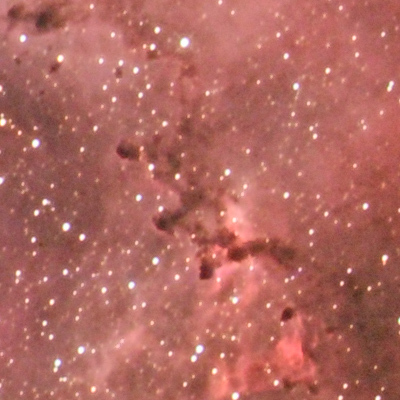 I think the Astro40D is an excellent camera for widefield astrophotography with Canon lenses. There is no need to worry about custom adaptors, LiveView focus is as easy as it gets, fast lenses are readily available and optically well matched to the sensor and it can easily be controlled with a programmable timer release - no computers required which makes for a very portable and enjoyable setup. The QHY9 though is a very impressive camera, especially so given its price. My first long exposure image with the QHY9 (of the Horsehead Nebula) convinced me that I had a very capable camera as it blew away my previous attempts with (non-cooled) DSLRs.